The movie world is currently a hit with the latest and fifth installment of the action-packed movie Die Hard starring Bruce Willis as detective John McClane. 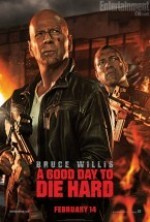 Titled A Good Day To Die Hard, the movie premiered around the world on Valentine's Day. There was a private screening the day before the launch at Century Cinemax at The Junction in Nairobi which included Radio Africa staff and others including former Truth Justice and Reconciliation Commission boss Patricia Nyaundi with her kids Steve and Debrah.